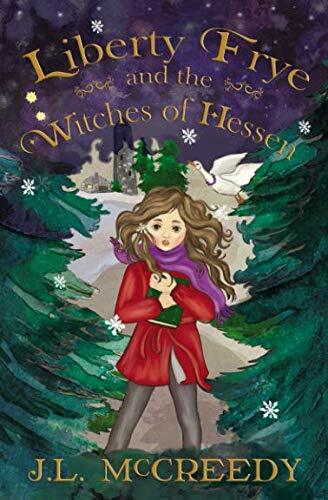 Liberty Frye and the Witches of Hessen is a book about a young girl named Liberty Frye, or Libby as she likes to be called. Libby and her family seem strange to everyone in their small town. They seclude themselves from society and don’t often meet with anyone, except when Mrs. Frye brings cakes and things to people who are sick. Also, the Fryes are overly protective of Libby, who hates that her parents won’t let her communicate with anyone beyond her classmates. One day, the Fryes receive a mysterious letter. Libby’s parents get really mad at her, and she doesn't understand why. Not long after that, her parents tell her that they are going to Germany to visit her grandparents, who they had previously told her were dead. On their trip, Libby’s parents get kidnapped. It’s up to Libby and her best friend Ginny to find and save them. Will they accomplish this monumental feat, or will they also get captured in the process? Find out in Liberty Frye and the Witches of Hessen! I thought that Liberty Frye and the Witches of Hessen was a good book filled with action, adventure, and mystery. I liked the plotline that the author, J.L. McCreedy, created; it pulled me in from the first page. Also, everything was well described: from Germany to the characters, it left a beautifully painted picture. A part in the book that I enjoyed was when Libby tried to escape from the castle in which she was being held. Did she succeed or not? You’ll have to read to find out for yourself. I loved this book from start to finish. I would recommend it to students ages 11 and up, though it has characteristics that would be appealing to readers of all ages. It would also be enjoyed by people who liked The Series of Unfortunate Events, as this book is similar in some ways. The reviewer's ability to summarize the story in an interesting, relatable manner (without giving away any plot twists), shows insight and maturity often missing from reviewers three times his age! It is clear that he didn't just read the story, but paid attention to the details. Thank you for such a thoughtful review! One person has no pants on during the book, and one person meets a pretty gruesome end.